Land Ownership, Guatemala, and a History of Agrarian Struggle | Small Farmers. Big Change. 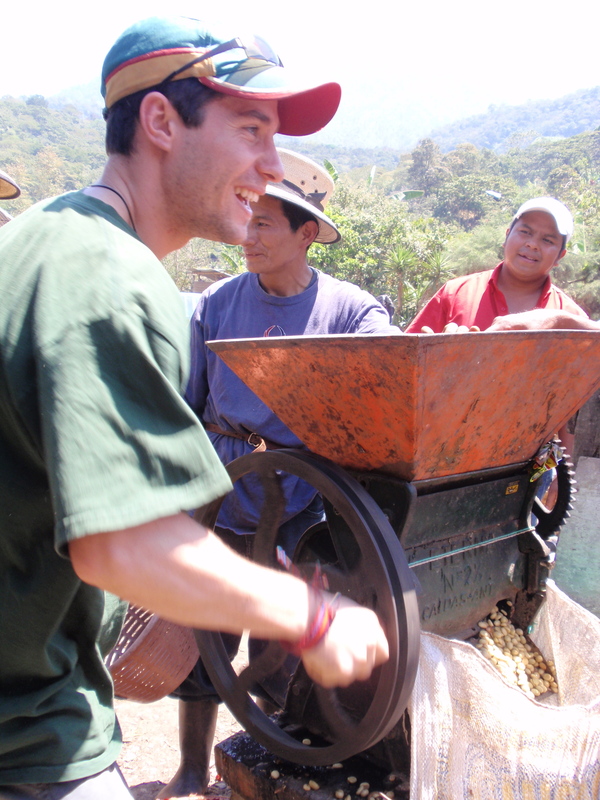 I recently had the chance to go on a delegation to Guatemala to visit our coffee farming partners in Chajul. The history of inequality put a lot of things in perspective for me. For the critics of Fair Trade who say that after all of the years, farmers are still poor, it is important for them to get a little background and understanding of the history of the farmers with whom we work. Guatemala provides an excellent case-study of the political and economic challenges, and successes, on the ground and a prime example of the importance of land ownership. There are many forces at work that have created, and continue to create, poverty and inequality in Latin America, but from what I learned in Guatemala, I’d like to focus on just one of these right now: land ownership. Guatemala has one of the highest rates of inequality in the world. Looking into the history of much of the world, Latin America included, land ownership, or rather lack thereof, is a key factor in explaining why the poor have been poor and will continue to be so unless power structures and politics are flipped on their head in the near future. They say in Guatemala that about 2% of the people own 98% of the land and that 22 families (the G8 as people jokingly call them) control almost all of the wealth. And it is no secret that most of these elite families also run, in a brutal manner of speaking, the government. The “G8” has maintained their political and economic hegemony through a series of violent repressions and alliances with the military and foreign governments (read, “The United States). The last time the dispossessed in Guatemala tried to change these dynamics in1954 resulted in the ouster of the reformist President at the time, Jacob Arbenz. Arbenz was attempting to reverse, ever so cautiously, hundreds of years of feudal, oligarchic rule in the country, and similarly to the late coup of Honduras’ President Zelaya (and U.S. involvement), the affluent and majority land-owners resisted and put the movement down. Traditionally the indigenous population of Guatemala was “conscripted” to work on plantations belonging to the country’s small, aforementioned, landed elite. In return they were allowed to work a small plot of land for subsistence living, and in the case of a particularly “benevolent” owner, were offered some level of healthcare, education for their children, and the occasional gift – such as alcohol during their annual fiestas. This paternalistic system ensured all parties involved could keep doing what they were doing: Plantation owners could extract resources (while exploiting cheap labor) and become wealthy while workers could survive and give their children about the same chances of having a good life as them; meaning, they didn’t have much hope for escaping extreme poverty. Land is necessary to grow crops but without owning land, any acquired benefits belong to the owner. With farmer population numbers stabilized (for a long time the Guatemalan government mandated that the indigenous work on the plantations in order to service the growing export market), forced labor grew less fashionable and plantation owners no longer needed to give land for subsistence agriculture to retain workers. With unemployment on the rise in Guatemala and conditions on plantations hardly any better than they were 100 years ago, the problem of access to good land continues to plague Guatemala today. The Fair Trade system, at least looking back to its roots, operates under different principles than those of the plantation system. Association Chajulense & Manos Campesinos are two organizations that Equal Exchange works with in Guatemala who have dedicated themselves to building democratically run & organized co-operatives where, unlike plantations, farmers do own their land, can survive off of it, and reap the benefits associated with land ownership. Additionally, these Guatemalan co-ops have not just begun a process of land reform but of agrarian reform, meaning that people can be land holders and receive the necessary tools and know-how to use the land effectively since traditionally indigenous laborers were stripped of any educational agrarian opportunities. Success stories of (previously) subsistence farmers escaping the poverty trap demonstrate that both land and the tools to work the land (figuratively and literally) are necessary. Chajul, the co-op we visited more recently, provides farmers with trainings and technical assistance, distributes coffee seedlings, manure (for compost) and other inputs to make fertilizer to assist their farmers in learning how to farm sustainably and reap more benefits from their own land. Minimum and higher prices through Fair Trade are important boosts in helping people stay on their land, but the history of an agricultural model dominated by plantations cannot be reversed overnight and Fair Trade is only one tool of many potential ways one could envision transforming the way that trade works. 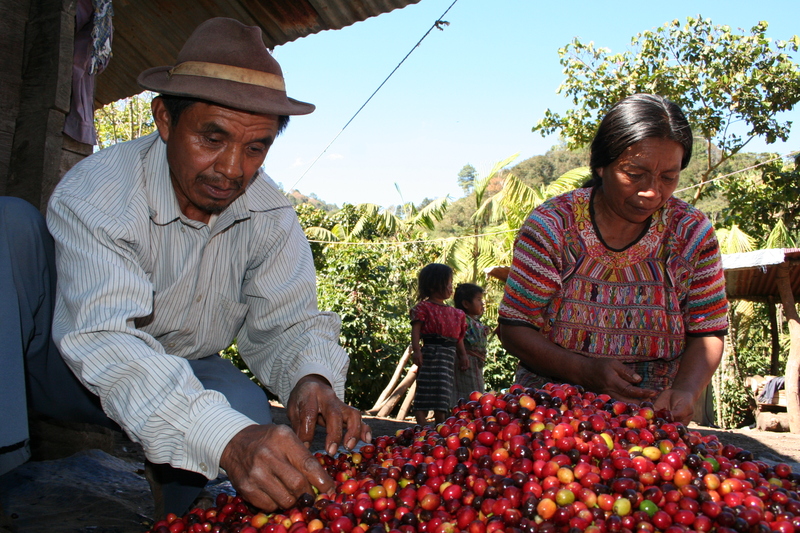 Central to Fair Trade are co-operatives and land ownership and consumers in the North should not be surprised that small farmers still face an uphill battle and that much work remains to do be done in achieving agrarian reform in Guatemala and throughout the Global South. Nevertheless, farmers in the Fair Trade coffee system (where at least for the moment, plantations cannot technically be certified) are slowly starting to see improvements in the quality of living and perhaps more importantly, have more control over their own destiny. and “States and Social Evolution: Coffee & the Rise of National Governments in Central America” ( see http://tinyurl.com/36djfvk ). The later actually offers one chapter each on Guatemala, El Salvador, Honduras, Nicaragua and Costa Rica, and in plain language explains how – for the most part – the local governments sided with large land-owners to either force the poor and indigenous off the best land and/or wrote laws to force the poor to work on the large estates (often as Andrew said for no pay and at the expense of their own small plots that were consequently left neglected). As Andrew mentioned about Guatemala the local armies and police forces in all of these countries were frequently and often brutally used on behalf of the large land-owners (tho less so in Costa Rica, which not coincidentally is today the most democratic and prosperous country in the region, and is the one with the strongest co-op sector). The bigger point is that contrary to what many casual observers think (especially the more vocal free-market advocates) the poverty we see today in the Guatemalan highlands and other coffee-growing regions is neither ‘natural’ nor self-inflicted. Rather there is a long history of abuses that helped create today’s grim reality – and which the Fair Trade & co-operative movements are trying to redress. You guys are doing a great thing. And I totally dig it!. I have messaged some friends about buying some stuff co-op. Thanks for your awesome ministry! Because of its quality I often buy Fair Trade coffee and after studying this with my son for a social assignment, I am definetly going to only buy Fair Trade coffee and try to promote it more.